As any good scavenger will know discarded building materials can provide rich pickings, provided it is taken with the consent of the builder. Wood of all types and sizes, doors, window frames, and bricks are all to be commonly found in skips up and down the UK – or worse, randomly discarded or dumped near the building site they were originally intended for. Doors and window frames speak for themselves, but builder’s wood of any quality or grade can be used for many things, including a must-have for a keen recycler or gardener – a compost bin. Pallets used for transporting bricks are especially useful for this purpose. More about this on our composting page. 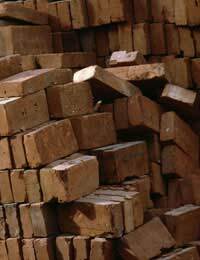 Bricks can be used for general household repair, perhaps for constructing a garden fence, or maybe something extremely worthwhile – a homemade brick barbecue. These can look really effective when home-designed, and particularly if you make a feature out of using many different types and colours of brick, all found on different scavenging expeditions! Bags of sand are an extremely useful commodity to find. Building grade sand probably isn't the right type to use in the garden to make a sand feature, but it is an essential component in making cement – perfect when building that barbecue. All these above suggestions are great ideas on a small-scale, but what can practically be done by the builder and those involved in the building trade to prevent materials wastage and unnecessary landfill? The most important step is to plan effectively to prevent wastage once the job is complete. Estimates in the building trade suggest that inaccurate planning often leads to at least 20% wastage of materials per building project. If everyone involved in the project, including the architect, builder and everyone on the team checked and double-checked their list of materials before purchase and delivery, a lot of this wastage would be eliminated. Another idea would be for builders to order and receive materials as the project progresses, rather than all at the beginning. On small-scale jobs this is easier, and the extra time for transportation, delivery, and delays would have to be built in to the project, but in the long-term, wastage would be prevented. An option also available to the builder is to use the service of reclamation centres. As discussed on a page of the same name, these centres act as a focus for materials of all kinds – bricks, wood, fireplaces – stuff that can't easily be found elsewhere by the general public. If a builder and a building project planner works with their local reclaimers, a project can take on a completely different look and feel, if materials are used from them, rather than simply ordered as standard from a builders merchants. As well as providing some of both the raw materials and possibly some of the details for the project, such as doors or fireplaces, the reclaimers can provide the service of buying or receiving materials at the end of the project, to store and sell on. This is preferable to the community and the environment than simply dumping waste in a skip, which is then taken to a landfill and dumped in!